Five years in the making, French property developer Pierre Beckerich’s model of full hotel service layered over Airbnb-type accommodation is finally opening on the edge of Paris’ Front de Seine. In the hands of creative director Ora Ito, a former office block has been updated and reconfigured into pop-coloured rooms for two, four and six guests. 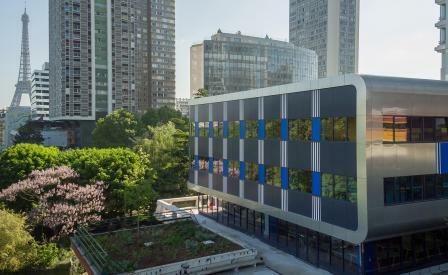 The curvaceous façade of the 1970s structure is clad in stainless steel and aluminium sections punctuated with deep blue and black panels, a gigantic fresco that provides the concrete towers of the Beaugrenelle neighbourhood with a new eye-catching landmark. If the striking graphics look familiar, it’s because Ito managed to lure his friend Daniel Buren onboard the project. In what is probably his largest permanent Parisian installation since his forest of columns at the Palais-Royal, the legendary French artist unfurls his trademark MO of coloured strips and blocks into the interior hallways. And in the rooms, Ito channels a similar pop-art sensibility with red, green, blue and yellow panels that are an explicit homage to Mondrian and Charlotte Perriand. A sprawling rooftop garden, besides featuring views of the Seine and the Eiffel Tower, supplies the house restaurant and cooking school with a seasonal bounty of green beans, tomatoes, herbs and strawberries.